The Knowles Family Director of Men's Golf, Conrad Ray, has announced the signing of two talented high school seniors, Cameron Wilson and Shane Lebow. The two will join the Cardinal on the links for the 2010-2011 season as part of the Stanford Class of 2014. 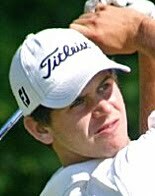 Wilson, from Rowayton, CT and St. Lukes School in New Canann, CT is currently ranked 7th in the high school class of 2010 by Golfweek / Sagarin. He has recently been named the Metropolitan Golf Association Jerry Courville Sr. Player of the Year for 2009. He is the youngest winner in the history of the award. In 2009 he was also named an American Junior Golf Association All-American as well as a picked as a member of the U.S. Challenge Cup and AJGA Canon Cup Teams. Wilson made it to the round of 8 in the 2009 USGA Junior Amateur at Trump National Golf Club, finished 1st in the 2009 MGA Met Amateur, 1st in the 2009 AJGA Nationwide Open at the Ohio State Scarlet Course, and first in the 2009 Carter Cup at Baltusrol Golf Club. He was also made it to the round of 32 in the USGA Men’s Amateur. Here's an insider profile from the AJGA of Cameron. Lebow, from Santa Barbara, CA and Santa Barbara High School is currently ranked 27th in the high school class of 2010 by Golfweek / Sagarin. In 2009 Lebow finished 8th in the AJGA Emerson Junior Golf Classic, 9th in the Callaway Junior Worlds, 4th in the AJGA Heather Farr Classic and had multiple other top-25’s on the AJGA Tour. Lebow was also named to the 2009 AJGA HP Scholastic Junior All-America Team. Here's a brief write-up in ESPN's Rise magazine about Scott and another AJGA Insider profile on Scott. Wilson and Lebow will start with the team next fall as the Cardinal Golfers look to win the 9th National Championship. The Cardinal wins the Gifford Collegiate by three strokes played at CordeValle in San Martin, CA with a solid final two days of play in the final tournament of the fall season. Playing against a strong field including #1 ranked Oklahoma State (which finished second), Stanford was led by junior All-American Sihwan Kim (see photo) who finished 2nd individually firing rounds of 68-68-71 for a 9-under 207 total. He was followed by sophomore David Chung who finished strong to tie for 3rd individually at 208 total with rounds of 73-68-67. David's final round was marked by a total of 7 birdies. Freshman Andrew Yun tied for 18th at 2-under 214 with consistent play resulting in rounds of 71-71-72. Junior All-American Steve Ziegler was tied for 23rd at 1-under after rounds of 71-72-72, followed by freshman Andrew DeDecker's 3-over par tourney to tie for 41st after rounds of 71-71-77. Yet another freshman, Steven Kearney had a solid 2-under final round 70 to tie for 76th after rounds of 78-79-70. Playing as an individual, junior Graham Brockington tied for 50th with rounds of 79-71-72. STANFORD, Calif. - The second-ranked Stanford men's golf team will close out its fall schedule at the Gifford Collegiate Championship, which is being played Nov 9-11 at CordeValle in San Martin, Calif. The 14-team, 54-hole event continues through Wednesday at CordeValle. The Cardinal, ranked second in the latest poll released by GolfStat, will look forward to a showdown with top-ranked Oklahoma State along with USC and host UCLA. Augusta State, Duke, Lamar, Long Beach State, Northwestern, Ohio State, Colorado, UNC Charlotte and Oklahoma round out the field. Stanford head coach Conrad Ray is expected to start a lineup consisting of Sihwan Kim, Steve Ziegler, David Chung and 3 freshmen, Andrew Yun, Steve Kearney and Andre De Decker. Graham Brockington will be playing as an individual. Kim is coming off a strong showing at the Isleworth Intercollegiate in Windemere, Fla., where he finished second in one of the strongest fields assembled on the fall schedule. The fifth annual CordeValle Collegiate Golf Championship has been re-named the Gifford Collegiate Championship at CordeValle, to honor its long time sponsor and Bay Area philanthropist Jack Gifford. Gifford who passed away unexpectedly in January and his wife Rhodine have been long time supporters of collegiate sports and have been major contributors to UCLA's athletic programs. Mrs. Rhodine Gifford will continue to support the Gifford Collegiate Golf Championship that her husband Jack founded. Stanford Golf Coach Conrad Ray, whose team won the 2006 event, noted "The Gifford Collegiate Championship is a great way to recognize an amazing man, Jack Gifford. Jack was a builder of young men. His interest in collegiate athletics was a true example of this. CordeValle is one of the best venues in the country, the field is as strong, and we here at Stanford are eager to compete. Jack would be proud and his legacy will live on through this amazing event." CordeValle was recently named California's #1 golf destination by CondeNast Traveler's June 2007 Readers' Poll and was ranked the #13 golf resort in North America, the Caribbean and Atlantic, Ireland and Scotland. CordeValle was also ranked in the top three in the 2007 - 2008 issue of Zagat Guide's America's Top Golf Courses. GolfWeek has Stanford ranked 2nd behind Oklahoma State in their latest national poll of men's college golf teams. GolfStat, the official source for college golf scores and statistics also has the Cardinal ranked 2nd behind Oklahoma State -- GolfStat head to head standings. Stanford is picked as preseason #1 by Golf World/Nike Golf men's coaches' poll has Stanford in 3rd position behind Oklahoma State and Washington.